National Technical Systems, Inc. (Nasdaq: NTSC) ("NTS"), a leading provider of engineering services, needed liquidity to finance acquisitions and fund working capital requirements. 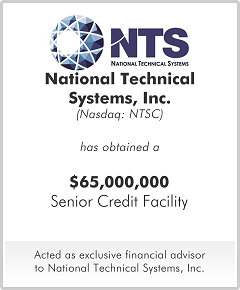 NTS had a $16.5 million revolving credit line with approximately $16.3 million in outstanding term debt. NTS engaged M&A Capital to evaluate all of its debt options. M&A Capital assisted NTS in obtaining a senior credit facility of up to $65 million, including a $20 million term loan, a $25 million revolving credit line and a $20 million acquisition line. The bank group consisted of Comerica Bank, Bank of the West and U.S. Bank.